Do you have a penchant for unique furniture? I presume that if you love unique art pieces, you will be delighted to have a piece or two displayed in your abode. Have you heard of Harringtons? It's my first time to hear the word but after googling it I found out that it is one of the best kept secrets in the South for unique furniture and art lovers who simply cannot resist a good hunt for pre-loved furnishings, one of a kind collectibles and antiques. Discerning buyers and bidders—who are usually avid collectors searching for beautiful and rare purchases—are treated to an auction with a relaxed welcoming vibe in a 650-sqm gallery and showroom maintained by a team devoted to giving quality and value for money for both the home enthusiast and avid collector. 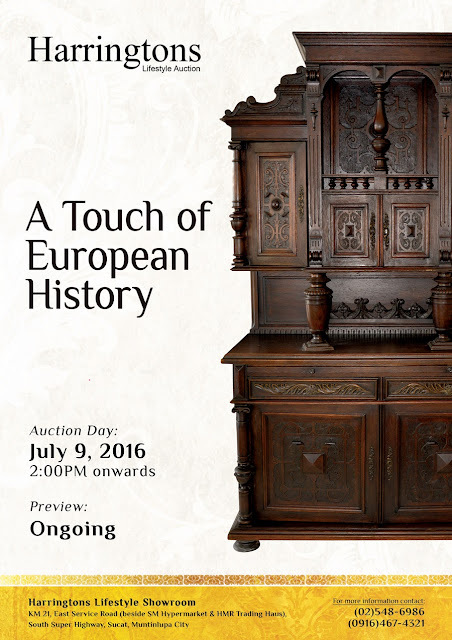 Harringtons next highly anticipated auction of exquisite European furniture will take place in July 09, 2016 at 2:00 o’clock pm Preview and Registration is ongoing. What’s even more exciting is that you don’t have to wait until then to get your hands on rare pieces to add to your home because Harringtons is currently selling beautiful and unique European furniture, timepieces, accessories, and paintings at reasonable prices. Appreciating their buyers’ discerning taste, Harringtons distinguishes itself by providing quality, authentic, and well-curated paintings, furniture, antiques, sculptures, photographs, historical pieces, memorabilia, jewellery, watches, and vehicles—both classic and collectible pieces. Harringtons Lifestyle Auction and Showroom is the place to visit for unique vintage furnishings in the Philippines. Seek out this best kept secret place in the South rare pieces with in your reach. I'm so excited to tell this news to my relatives who love collecting unique pieces for their home. I'm sure that art and lifestyle aficionados will score different pieces at reasonable prices from Harringtons. Harringtons Lifestyle Showroom - HMR Compound (KM 21 East Service Road South Super Highway, Sucat Muntinlupa City, 1780 Muntinlupa City).